View More In Maternity Pillows. 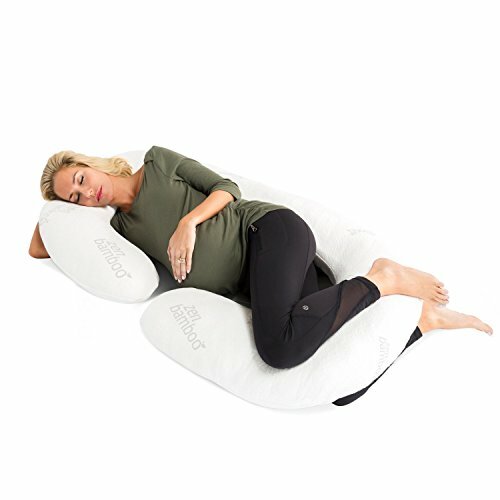 The Zen Bamboo Pregnancy Pillow is designed to follow the natural contours and shape of the body, providing support for any side, stomach, or pregnant sleeper. This pillow supports your head, back, legs, and belly all at the same time! The unique shape and size of this pillow supports your body to prevent and relieve sciatica, heartburn, and lower back pain. Designed with an ultra cool and breathable cover made from a jacquard weaved blend of rayon derived from bamboo and brushed microfiber, this pillow has a soft cover that feels excellent against the skin. Just machine wash and tumble dry for easy care. We are so confident in the quality of our product that we offer a 30-day satisfaction guarantee. Don't wait! Buy your Zen Bamboo Pregnancy Pillow today and enjoy the most comfortable night's rest you've ever experienced! THE ONLY PILLOW YOU NEED: The Zen Bamboo Body/Pregnancy Pillow takes the place of multiple pillows saving valuable bed space. It supports your head, back, and belly all at once! EASY TO CLEAN: Designed with an ultra-soft, zippered rayon from bamboo blend cover for easy removal and cleaning. Just machine wash and tumble dry for easy care. RELIEVES PAIN: The unique, proprietary shape of this pillow supports your head and back to prevent and relieve sciatica, heartburn, and lower back pain. DESIGNED FOR YOU: The Zen Bamboo Pregnancy Pillow is designed to follow the natural contours and shape of your body for full support. Our pillow was crafted for pregnant mothers but is comfortable for everyone! SATISFACTION GUARANTEED: We are so confident in the quality of our product that we offer a 30-day satisfaction guarantee! If you are unsatisfied, simply contact us to return the product for a full refund. If you have any questions about this product by Zen Bamboo, contact us by completing and submitting the form below. If you are looking for a specif part number, please include it with your message.